The Terror from the Other Dimension! They Came from New Jersey! Episode 3: Chuck Banner finds an ancient spaceship ferrying the survivors of a planetary holocaust toward a distant new home — and uncovers an astonishing secret that could tear their small society apart. Space plays tricks on the senses. In the absence of gravity, a person can easily be fooled into believing that they are standing still while the entire cosmos spins around them. Even experienced space travelers have to remind themselves to distrust their senses when stepping outside the comfortable artificial-gravity environment of a spaceship and floating into the void. However, there are times when even the veterans willingly allow their senses to trump their rational mind in order to enjoy the sheer poetry and majesty of the experience. 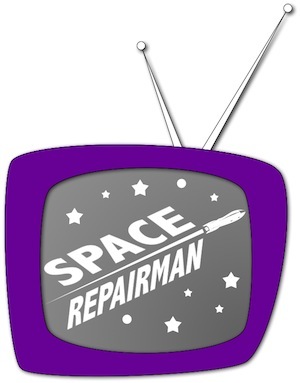 For Space Repairman Chuck Banner, however, this was not one of those times. As he walked carefully along the silver outer hull of his sleek ship Ranger, it didn’t matter to him whether it was the gas giant Felora XIV that was spinning outside his clear glass bubble helmet, or whether it was he who was the one in orbit. Either way, in less than an hour he would be crossing the planet’s terminator into night. Banner needed the natural light from the Feloran sun reflecting off the planet’s yolk-colored clouds to help him spot the problem with the Ranger’s turbo-encabulator, which was only accessible by a spacewalk. The magnetic soles on Banner’s oversized spacesuit boots held him firmly to one of the ship’s curving fins as he opened a hull access panel to expose the complex machinery of the device. The turbo-encabulator’s function was something of a mystery even to such an experienced technician, so before attaching his space spanner to the first of the visible lug nuts, Banner paused. Through the silence, Banner could imagine the tape reels on F.R.E.D.D.’s barrel chest spinning futilely in search of an answer. “unable to comply,” came the reply at last. “I wonder if the bolling shim has managed to untanker itself,” Banner muttered as he played the flashlight beam around the device’s dark-gray innards. “that would explain the readings we are seeing,” F.R.E.D.D. responded. “affirmative. stand by for the dispatcher.” A half-second of static followed. The Ranger arrived at the coordinates less than two hours later. In the cockpit, Banner saw the derelict while the were still several minutes away. He pointed it out to F.R.E.D.D. “Look at that. It’s huge!” The derelict looked like a gigantic gray oil drum, two miles long and at least a mile in diameter. As they approached, Banner could see from the faded markings on its hull that the object was rotating slowly along its cylindrical axis. Banner did a quick mental estimate and concluded that the rotation was nearly one revolution per minute, which was slow enough to allow the Ranger to approach and clamp on if necessary. “i am unable to analyze the interior of the vessel but based on its apparent motion i estimate that it is not solid, said F.R.E.D.D., seated in the co-pilot chair next to Banner. “Good, that will make this easier.” Banner steered the Ranger into position. “Okay, buddy, let’s do this.” Banner pushed the lever to activate the lasso beam. From an emitter on the top of the Ranger’s hull, a thin beam of glowing blue light extended into space until it reached just ahead of the derelict. At the end of the beam, a circle appeared and steadily grew until it was wider than the circumference of the derelict. “Steady, steady . . . ” Banner called as he played the controls delicately, keeping a watchful eye on the beam’s progress and the motion of the object. “Just a little bit more . . . ” Banner guided the circular lasso beam over the derelict until it was centered perfectly halfway down the length of the cylinder. “Got it!” The blue light of the lasso beam pulsated brightly as its magnetic field intensified, ensnaring the object safely. “forty percent acknowledged.” F.R.E.D.D.’s spindly metal arms reached out to the engine controls and pushed several buttons with his claw hands. The Ranger began to move slowly. The thin blue beam that connected the ship to the energy circle surrounding the derelict began to stretch, then moments later began to contract like a rubber band, pulling the object off its course and in the direction of the Ranger. Tied by the lasso beam, the Ranger and the gigantic object slowly departed the Alpha Centauri spacelane. When they were well clear of the traffic corridor, Banner powered down the lasso beam and F.R.E.D.D. brought the ship alongside the slowly spinning object. They glided up and down the length of the object in search of anything that would identify it. “Wherever it came from, it’s been out here a long time,” said Banner. Close up, they could see that the hull was deeply scarred and pitted from space debris of all sizes. The metallic surface looked burned and fried, as if it had been exposed to the light of thousands of suns — or of a few suns for thousands of years. perhaps we should await the arrival of the salvage authorities,” F.R.E.D.D. said, his monotone metallic voice nonetheless conveying a sense of unease. “Well, I am,” Banner said eagerly as he got up from his chair and reached for his silver spacesuit and bubble helmet on the wall behind him. The hatch proved to be easy to open, and Banner cautiously stepped down through the circular hatchway. Before he did, he gave a confident wave to F.R.E.D.D., who was observing Banner’s progress from the Ranger as it orbited the derelict at the same rate of rotation. That way, the ship would appear to remain stationary above the hatch, in case Banner needed to leave in a hurry. As Banner descended into the dark, a light suddenly flickered on and Banner found himself in a small five-walled chamber, about large enough for three people to stand comfortably. A hatch, similar to the one through which he had just descended, was on one of the walls. “I’m in an airlock,” Banner called to F.R.E.D.D. “be careful chuck,” called F.R.E.D.D. “Don’t worry, buddy. I will.” He operated a control that looked like the most logical choice, and sure enough the inner door began to swing open. Banner stepped out of the airlock into a narrow corridor that extended as far as he could see in either direction. He could see other corridors branching off in either direction at regular intervals. Everything was lighted, if dimly, by overhead lighting panels. There wasn’t a sound, not even the hum of ventilation. “Hello?” Banner called out, his voice echoing and disappearing down the empty corridors. He shrugged and picked a direction at random to begin exploring. As he walked down the corridor, his footsteps the only sounds to be heard, Banner carefully noted details in an effort to identify the object. It was clearly a spaceship of some sort. He noted that the control banks along the walls had writing above them, but the symbols were completely unfamiliar. Banner stopped to study one of the control panels in an effort to identify their purpose and decipher their markings. He was so intent on his task that he didn’t notice the shadow on the wall behind him, slowly moving toward him. As the shadow got closer, it resolved into the shape of a humanoid — and in one raised arm was the unmistakable silhouette of a ray gun. Want to read the rest of this serial? 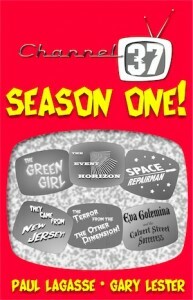 Then buy the Season One anthology paperback! You’ll get four complete feature-length serials and the complete seasons of The Event Horizon and Space Repairman, and much more, for just $14.95!